(Newser) – As five more states voted to legalize recreational marijuana last week, Denver took it a step further: A ballot measure to allow social marijuana use has narrowly passed, according to vote count updates released Tuesday, the Denver Post reports. The measure will allow marijuana use in "consumption areas" at businesses including bars, cafes, and even yoga studios. 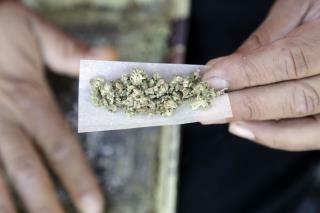 Colorado was the first state to legalize recreational marijuana, but public consumption remained banned. Backers of the latest measure described it as a way to give tourists—and residents whose landlords ban pot—a place to legally smoke or vape marijuana. Christ!! What will be on ballots next time? Legal "primo" ?? Or worse LSD? Soon America will be obsessed with unicorns, rainbows, & floating castles. Hobos from anywhere will be able to cross our open borders while America gets high. So sad ehh. . .
Colorado -- The new Haight-Ashbury!